This tremolo arm does not have the traditional plastic tip, instead the tip end of the bar is rounded as depicted in the photograph to the right. Each tremolo arm is then entirely polished to a finish very similar to chrome. All of our tremolo arms are designed around a free-floating bridge setup to create their proper tip-to-pickguard distance. To effectively use any of our shortened tremolo arms your bridge must be setup as free-floating. 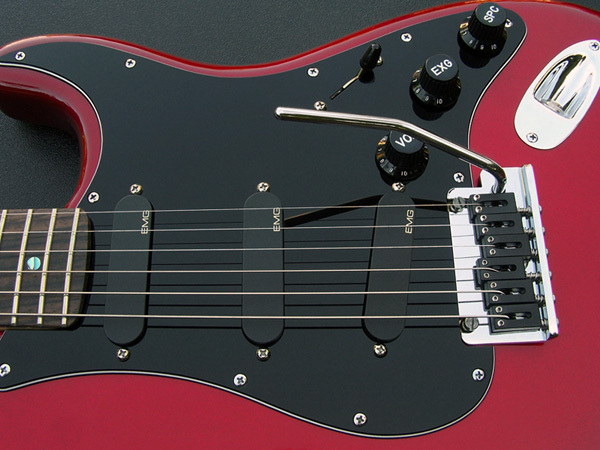 These tremolo arms will NOT fit the new American Professional Strat®. There are two set screws on the back side of the Ultra, Deluxe and Elite Strat® tremolo block, they dictate the insertion and rotational friction of the tremolo arm. These set screws use a 3/32" hex wrench, one is accessible just under the top plate on the back side of the bridge the other requires removal of the bridge from the guitar. Both of these set screws pinch the tremolo arm plastic bushing for a tighter tremolo arm fit. The upper set screw is primarily used to dictate the tremolo arm rotational friction, the lower set screw is primarily used to dictate how firm or loose the tremolo arm engages the retaining clip. The lower screw can typically be left loose, not pinching the bushing and your arm will engage the retaining clip easier. We machine (reduce) the diameter of insertion tip of these tremolo arms down to approximately 0.186" (depicted in red circle in photograph to the right) which helps with an easier insertion/extraction since the retaining clip does not have to be pushed as far aside in order for it to ride up into the retention groove. This does not change how it engages the retaining clip. Still, some of American Deluxe and Elite Strat's have a very firm insertion/extraction of the tremolo arm. Just getting some tremolo arms to engage/disengage the retaining clip can be difficult and our design helps to minimize this known problem. IMPORTANT - MUST READ! 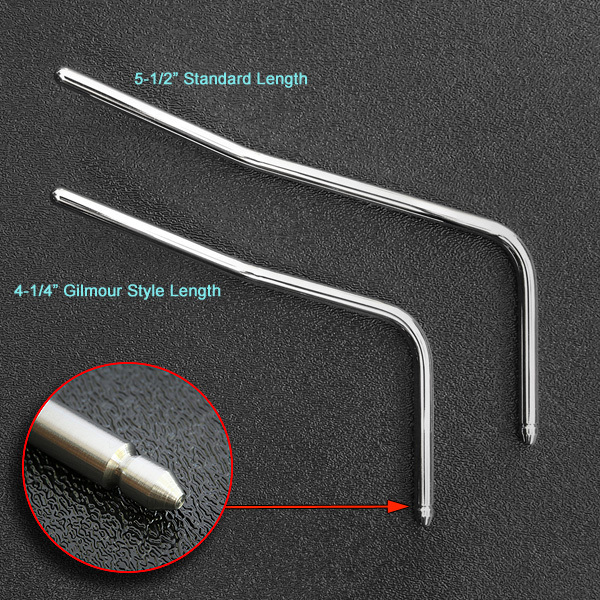 Our pop-in tremolo arms are 0.218" in diameter, Fender's original tremolo arms vary from 0.214" to 0.218" in diameter and the inside diameter of the black plastic bushing in the tremolo block varies by a few thousandth's of an inch therefore some adjustment may be required to the plastic bushing in your tremolo block for our tremolo arms to insert easily. It may be required for you to adjust (loosen) the two tremolo arm tensioning set screws on the back side of your tremolo block or possibly ream out the bushing by a few thousands in order for our tremolo arm to insert easily. If you determine it is necessary to ream out the plastic bushing, remove the bridge from the guitar, disassemble the bridge by removing the saddles and top plate, remove the two tensioning set screws so they're not pinching the bushing, remove the tremolo arm retaining clip and only then attempt to ream the black plastic bushing with a sharp #1 (0.228") drill bit which can be purchased here. Reference this article for additional information. Each of these tremolo arms are custom fabricated for each order, they do not qualify for return, exchange or refund, no exceptions. Give us 1-5 business days (M-F) to fabricate your tremolo arm. Depicted above is the 4-1/4" Gilmour style length and the standard 5-1/2" length pop-in tremolo arms. Close-up detail of tip end that secures into the tremolo block. Depicted above is the 4-1/4" Gilmour length tremolo arm.